The diagnosis of Parkinson's disease is mainly clinical. DaT SCAN may help in difficult cases. Depression is also a clinical diagnosis and is common and persistent symptom in Parkinson's disease. Dementia is very often in Parkinson's disease, but usually not at the first stages. The treatment of each of the above symptoms is difficult and a lot of times individualized. Female 64 years old patient with history of hypothyroidism, depression and anxiety disorder was examined at outpatient Memory and Dementia clinic of 3rd Department of Neurology. The patient's major problems were functional and cognitive decline, severe extrapyramidal symptoms and depression. According to UKPDS Brain Bank criteria the patient had bradykinesia, muscular rigidity, postural instability and rest tremor present with unilateral onset of the symptoms affecting left side most and progressive course. The modified Hoehn and Yahr scale was 3: mild to moderate bilateral disease; some postural instability; physically independent. The symptoms remained during nine months follow up, despite the pharmaceutical treatment. Nine months later, the patient made an attempt to suicide. Firstly, she was transferred to intensive care department with 2nd degree burns and respiratory problems, then she was hospitalized at the Burn Unit and afterwards at the Psychiatric clinic. One month later the patient had no depression, a clear reduction of the extrapyramidal symptoms, functional and cognitive improvement. An astonishing improvement occurred after the threat of life. Two years after the attempt to suicide, the depressive symptoms remain in remission and functional and cognitive status is normal. The extrapyramidal symptoms have disappeared. The diagnosis of Parkinson's disease (PD) is, most of the times, clinical with sensitivity of 88% and specificity 78% [1, 2]. DaT SCAN may help in difficult cases [3, 4]. Depression is a common (up to 40%) and persistent symptom in Parkinson's disease [5, 6]. Depression is sometimes the first symptom of PD . Other authors suggest that depression is a risk factor for PD . The treatment of the depression in PD is difficult because of the lack of evidence . Dementia also has high prevalence in Parkinson's disease . Drug induced Parkinsonism should also be considered as a possible diagnosis. It is reported to be 20% of the patients with Parkinsonism . It is well known that depression is associated with cognitive decline. Pseudodementia is a term that is usually used, but does not exist as an entity to any classification system. Furthermore depression has proved to be a risk factor for dementia and elderly patients with depression should have an ongoing monitoring for their cognitive function . A 64 years old Caucasian female patient, education: 6 years, with history of hypothyroidism, depression, anxiety disorder and extrapyramidal symptoms was examined at our Memory and Dementia outpatient center on 26/1/2007. Depression with anxiety disorder started in summer of 2004. From 28/7/2004 to 22/11/2004 (4 months) the patient was taking Citalopram 20 mg per day and Alprazolam 0.5 mg three times per day. On 22/11/04 Citalopram was changed to Mirtazapine 45 mg per day and Alprazolam was changed to Prazepam 20 mg per day. On 2/11/2005 Sulpiride 50 mg three times per day was added. It is the first time that the patient takes antipsychotic treatment. Prazepam was stopped. On 4/1/2006 (after 13 months use) Mirtazapine was changed to Chlorimipramine Hydrochloride 75 mg per day and Alprazolam 2 mg per day was added, while on 17/1/2006 Risperidon 0.5 mg per day was added and Sulpiride was stopped. That treatment stayed almost the same (Risperidon was raised to 1.5 mg per day for two months, 19/7/06-21/9/06, but remained to 0.5 mg for the period 21/9/06 to 26/1/07 when the patient came to our clinic). The patient's major problems were functional and cognitive decline, severe extrapyramidal symptoms and depression. The hypothyroidism was controlled (Levothyroxin) and for depression and anxiety disorder the patient was taking Perphenazine/Amitriptyline hydrochloride 25/2 mg twice/day, Risperidon 0.5 mg/day, Prazepam 5 mg/day. According to United Kingdom Parkinson's Disease Society (UKPDS) Brain Bank criteria the patient had bradykinesia, muscular rigidity, postural instability and and rest tremor present with unilateral onset of the symptoms affecting left side most and progressive course. None of the exclusion criteria occurred. The modified Hoehn and Yahr scale was at the stage 3: mild to moderate bilateral disease; some postural instability; physically independent. The patient performed the Unified Parkinson's Disease Rating Scale (UPDRS) . For the part I Mentation, Behavior and Mood the score was 7. For the part II Activities of Daily Living the score was 23. 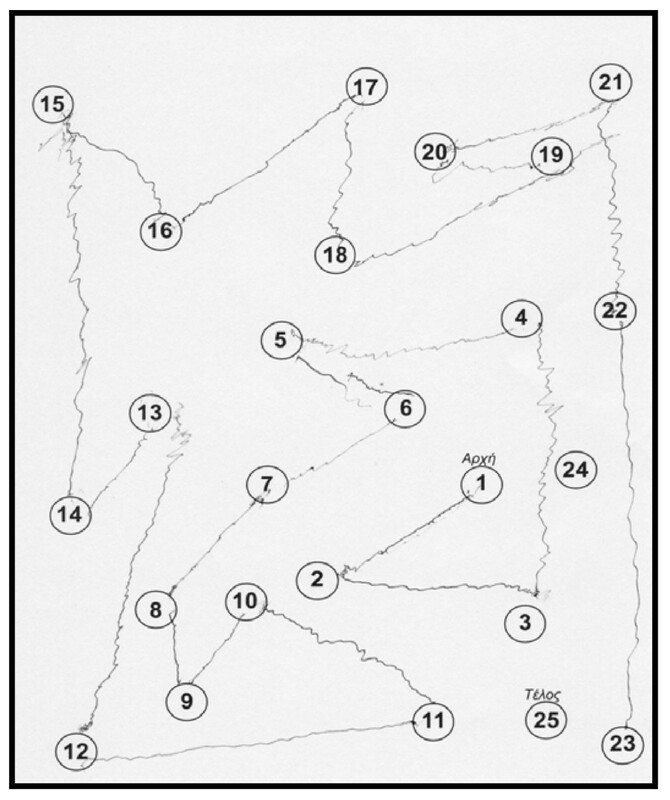 For the part III Motor Examination the score was 59. 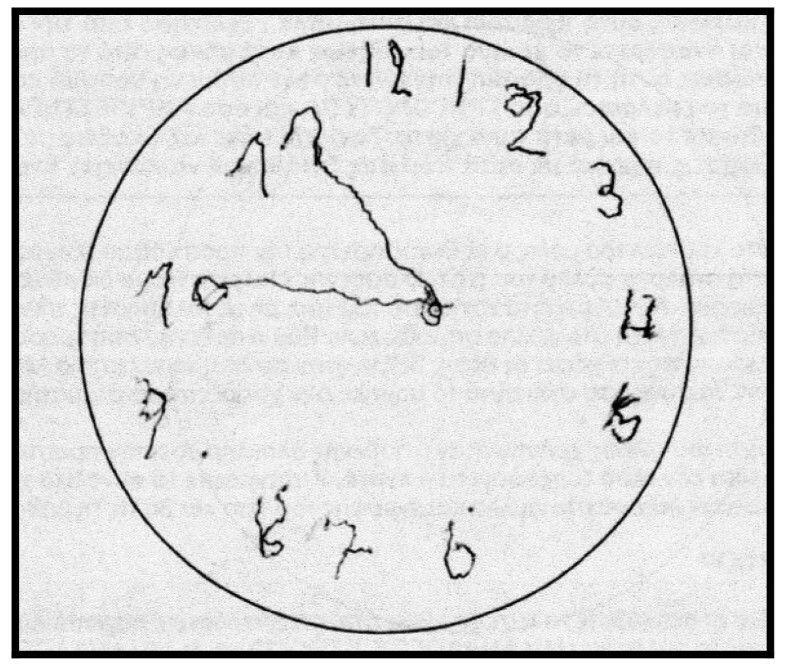 For the part IV Complications of Therapy the score was 1 (presence of early dystonia). The neuropsychological examination showed: Mini-Mental State Examination (MMSE): 22/30, Cambridge Examination for Mental Disorders of the Elderly (CAMCOG): 49/107, Functional Rating Scale for Symptoms in Dementia (FRSSD):17, Geriatric Depression Scale (GDS):12/15, HAMILTON: 19. Escitalopram 10 mg per day was added. The neuropsychological examination of the patient showed an improvement in cognitive and functional symptoms as well as in depression: MMSE: 25, FRSSD: 8, GDS: 10, HAMILTON: 13. Risperidon gradually was reduced and stopped, Tiapride was added. The neuropsychological examination showed MMSE: 21, FRSSD: 11, Functional Cognitive Assessment Scale (FUCAS): 84, GDS: 12, HAMILTON: 26. Tiapride was stopped because there was no difference in depression and extrapyramidal signs. The United Kingdom Parkinson's disease Society (UKPDS) Brain Bank criteria and the modified Hoehn and Yahr scale remained the same, as at visit 1. Carvidopa/Levodopa/entacapone (25/100/200) mg was added. Escitalopram 10 mg was raised to three times per day for the resistant depression. The patient performed the Unified Parkinson's Disease Rating Scale (UPDRS) and the score was the same as visit 1. 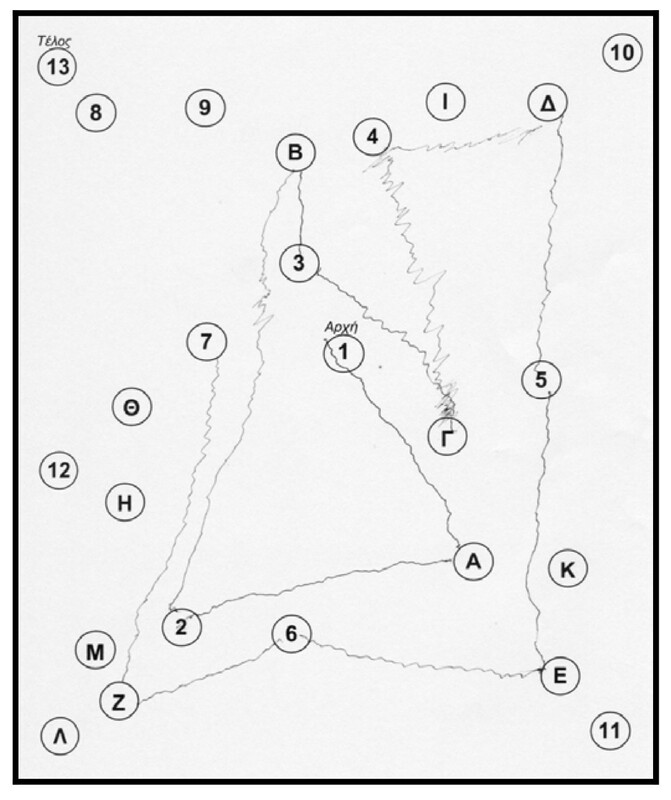 The rest neuropsychological examination: Trail Making Test, part A: impaired, (figure 1) part B: impaired (figure 2). Controlled Oral Word Association Test (COWAT): 2-3-3. Boston Naming Test (BNT): 17/30. 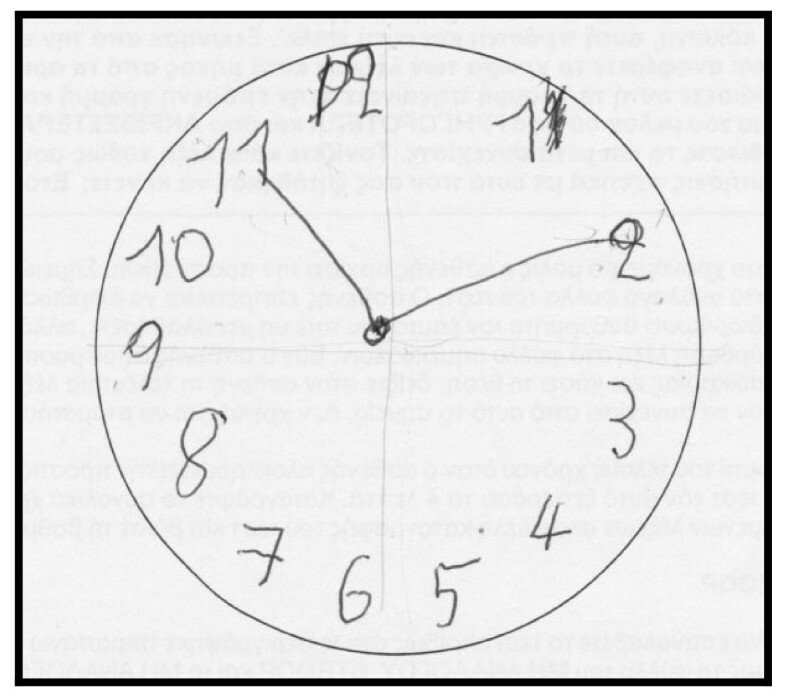 Clock Drawing Test: impaired, 3/10 (figure 3). CT was performed on 24/4/07 with no particular findings, just mild atrophy. Trail Making Test on 3 rd May 2007, part A, before the attempt. Trail Making Test on 3 rd May 2007, part B, before the attempt. Clock Drawing Test on 3rd May 2007, before the attempt. On 17/09/07 the patient refused to speak and eat and had negative behavior. On 21/9/07 the patient made an attempt to suicide by starting fire. She was transferred to the local hospital to intensive care department with 2nd degree burns and respiratory problems. On 9/10/07 she was transferred to the Burn Unit and on 15/10/07 to the Psychiatric Unit of our Hospital. The medication at the Psychiatric Unit was Quinapril/Hydrochlorothiazide 20 mg/day po, Carvidopa 300 mg/day po, Escitalopram 30 mg/day po, Mirtazapine 45 mg/day po, Quetiapine 200 mg/day po, Nadroparin Calcium 0.3 ml/day S.C, Iron protein succinylate 1 × 2, po, Levothyroxin 100 mg/day po. The patient performed the Unified Parkinson's Disease Rating Scale. Hence, there was a clear reduction of the extrapyramidal symptoms. 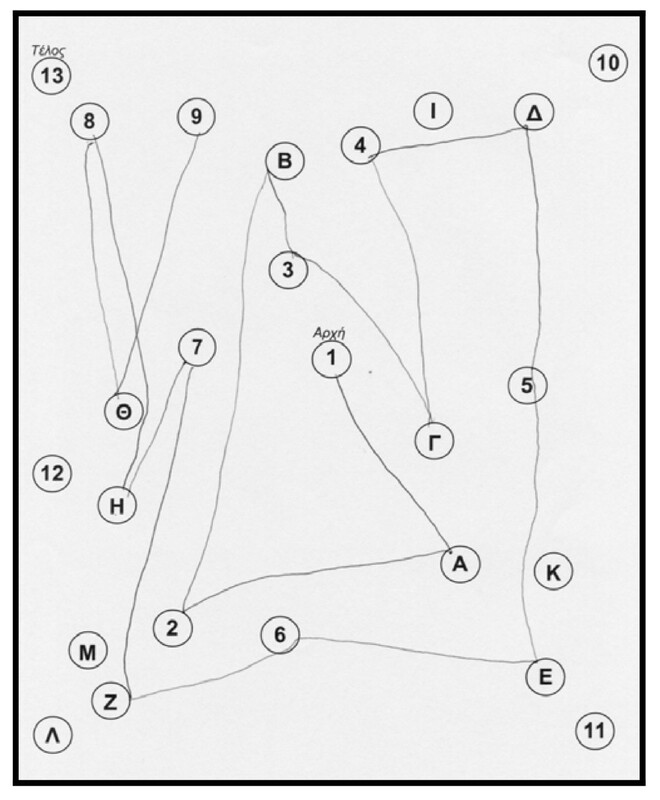 The neuropsychological examination showed an improvement: Trail Making Test, part A: done at 2 minutes and 18 sec, (figure 4) part B: improved (figure 5). Controlled Oral Word Association Test (COWAT): 6-5-4. Boston Naming Test (BNT): 21/30. Clock Drawing Test: 10/10 (figure 6). Trail Making Test on 19 th October 2007, part A, after the attempt. Trail Making Test on 19 th October 2007, part B, after the attempt. Clock Drawing Test on 19 th October 2007, after the attempt. The medication at that time was Mirtazapine 45 mg/day po, Escitalopram 30 mg/day po, Carvidopa/Levodopa/entacapone (25/100/200) mg S: 1*3, Levothyroxin 100 mg/day po. The patient had no suicidal thoughts, neither depressive symptoms. The MMSE score was 27, the FRSSD score was 0 and the Hamilton Scale score was 4. The UKPDS Brain Bank criteria are no longer fulfilled. The modified Hoehn and Yahr scale was at the stage 0, meaning no signs of disease. The patient had still no suicidal thoughts, neither depressive symptoms. On 2/1/2009 the MMSE score was 30. On 16/1/2008, I-123-DaTSCAN [3, 4, 13] was performed with the following findings (Table 1). The conclusion of the I-123-DaTSCAN was that these findings (rates out of the normal range for the Lenticular Nucleus) could not exclude the start of Parkinson's disease or the start of a mild extrapyramidal disorder. On 28/11/2008, another I-123-DaTSCAN was performed with the following findings, which exclude Parkinson's disease and other Parkinsonian Syndromes (Table 2). The brain MRI which was performed on 29/1/2009 was almost normal according to her age (mild periventricular leukoencephalopathy). An astonishing improvement occurred after the threat of life. The improvement is in functional cognitive and depressive symptoms. The parkinsonian symptoms also disappeared. The depressive symptoms remain in remission after a year and a half of follow up. One explanation is that the patient had Drug - Induced Parkinsonism-DIP- (Risperidon and Sulpiride), Drug induced dementia (Chlorimipramine Hydrochloride, Perphenazine/Amitriptyline hydrochloride-anticholinergic effect). On the other hand, DIP is dose-related  and Risperidon was given in a very low dose. Risperidon is also atypical antipsychotic, like Sulpiride which was also used previously for treating the patient. Another problem for the diagnosis of DIP is the findings of I-123-DaTSCAN on 16/1/2008 which support the diagnosis of Parkinson's disease. But this diagnosis was not clinically confirmed at the last visits, neither the 2nd I-123-DaTSCAN on 28/11/08 supported it. As far as the depression's remission, it is referred at the literature that depressed patients may experience significant relief of their depressive symptoms after the suicide attempt, but there is a high probability to undergo a relapse within a short period (3 months) . In this case there is no relapse so far. (Two years after the suicide attempt). A close longitudinal follow up of the patient might give us more answers. Written informed consent was obtained from the patient for publication of this case report and accompanying images. A copy of the written consent is available for review by the journal's Editor-in-Chief. 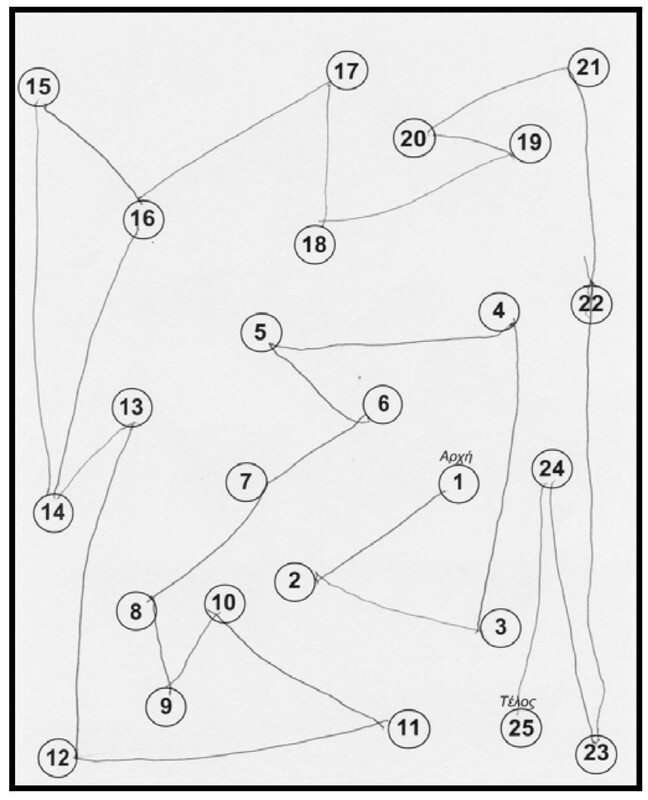 We thank the patient and the patient's son for their consent to publish this case report and for their cooperation. MT, CZM, MS, FF, DD and AK participated in the evaluation and care of the patient and her caregiver. MT coordinated and directed the work. MT and MS involved in writing the manuscript. CZM, FF and DD assisted in writing the manuscript. All authors read and approved the final manuscript.